President: Ka‘au Abraham recently joined the board in 2014 and has been a volunteer since the early 2000s. He has an extensive background in marine education and currently is the Maui Island Coordinator for NOAA’s Hawaiian Islands Humpback Whale National Marine Sanctuary. He has been a true advocate for the revitalization of Kō‘ie‘ie Fishpond as he educates Maui’s youth and visitors about its connection to the Hawaiian culture and marine environment. His leadership skills, knowledge about our site and his talents in education and public outreach has propelled him to be our president throughout 2016. Vice President: Brenda Asuncion was raised in Waipi‘o (‘Ewa, O‘ahu) and started volunteering at He‘eia fishpond during holiday breaks from Occidental College, where she received her B.A. in Biology with a Marine Biology emphasis. While pursuing her M.S. 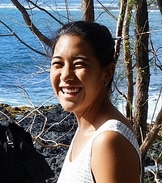 in Marine Science from Hawai‘i Pacific University, she continued to work at He‘eia and had many opportunities to visit and volunteer at other loko i‘a (fishponds). In 2013, she joined the team at Kua‘āina Ulu ‘Auamo (KUA) and currently facilitates a statewide network of fishpond stewardship organizations and practitioners known as Hui Mālama Loko I‘a. She empowered the Hui to visit fishponds statewide, including Kō‘ie‘ie in May 2014 and August 2015 where the Hui helped restore portions of our fishpond’s wall and installed the first mākāhā (sluice gate). In December 2015, Brenda was welcomed on to the Board of Directors of ‘Ao‘ao O Nā Loko I‘a O Maui for her experience and knowledge about fishponds and her ability to partner with other fishponds statewide. 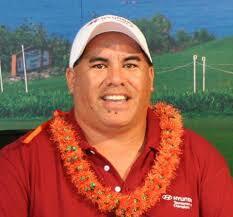 Treasurer: Kimokeo Kapahulehua is and has been the driving force of ‘Ao‘ao O Nā Loko I‘a O Maui since 2000. After serving as President for many years, Mr. Kapahulehua has transitioned to a different role as Treasurer as of December 2015. He is a highly respected Native Hawaiian practitioner and leader in the local community and is admired for his tireless efforts to educate Maui’s youth, care for our environment and perpetuate our Hawaiian culture. Mr. Kapahulehua is a past recipient of the National Volunteer of the Year Award by the National Marine Sanctuary Foundation. In 2013, he received the prestigious Mike Lyon’s Palaka Award for exceptional volunteerism and was honored on Akakū’s Walk of Heroes. Secretary: David Mackwell has been a board member since 2003. Mr. Mackwell’s interest in caring for Kō‘ie‘ie began in 1997 when he became concerned about extraordinarily large algal blooms affecting the fishpond and South Maui shoreline. He served as Chairman of Mayor Apana’s Seaweed Taskforce and helped guide invasive seaweed control efforts in South Maui. He has also volunteered with the Maui Coastal Land Trust and Kīhei Community Association. Executive Director: Joylynn Paman has spearheaded operations of ‘Ao‘ao O Nā Loko I‘a O Maui in this director capacity since 2008. She has been a devoted volunteer for this organization since 1997 and has served as its vice president for four years during this time. Throughout her career, Joylynn has integrated her passion for the Hawaiian culture, its traditions, practices and language with her love for the marine environment. In 1998, she graduated with a Bachelor’s degree in Marine Science and has worked in related environmental fields and environmental/cultural education ever since. Kia‘i Loko I‘a (Fishpond Protector): Vene Chun began volunteering with our non-profit organization in 2007 and was instrumental in guiding a group of young men in restoring the southern section of the fishpond’s wall. Since then, Vene continues to help restore the wall with help from other masons and educates students and visitors about the Hawaiian culture and fishponds. He also serves as our tour guide for our outrigger canoe tours and integrates Hawaiian chanting, folklore and language into his tours. His passion for the Hawaiian culture is emulated in his presentations to visitors of all ages.